Charlie Chomper Fun Bounce is another in the Fun Bounce series of playground spring rides that delivers a fun playground toy. The ride sits upon two heavy-duty coil springs. The steel base plate can be mounted to any type of surface. Charlie Chomper Fun Bounce doubles the fun as two children can use the Charlie Chomper Fun Bounce at the same time. Kids will enjoy Chomper and the life-like mold that includes a dinosaur tail, head, and arms. Molded footrests and handholds help kids maintain their balance while bouncing. Request Charlie Chomper Fun Bounce for your playground today! 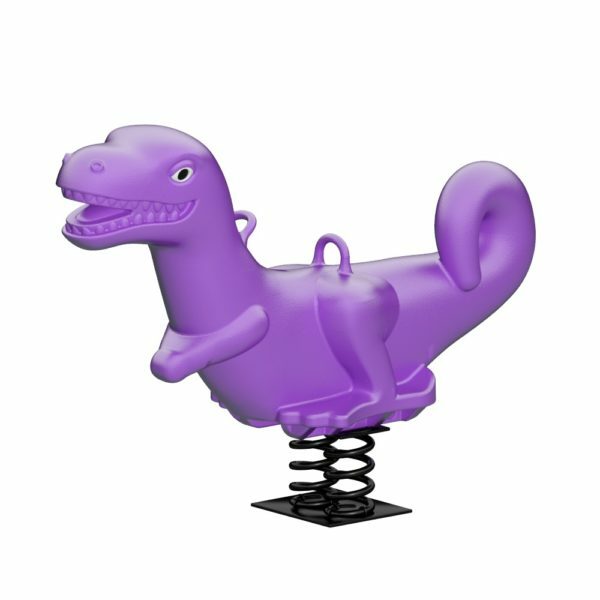 Charlie Chomper Fun Bounce is only available in purple plastic. Safety Zone – 13' 10” x 17'6"
Critical Fall Height – 2'4"